Timber ran really fast, stuck his contacts and made it through all the weave poles, but that's about all I can say about this boy's agility runs this weekend. The environment was so different than we had ever trained in and the atmosphere so intense that he was just insane. Insane! Turning around and jumping on me if I was behind him, doing his own course if I wasn't right there with him. Looks like we have lots more training to do. He reminds me alot of the way Farley was in his beginning days. 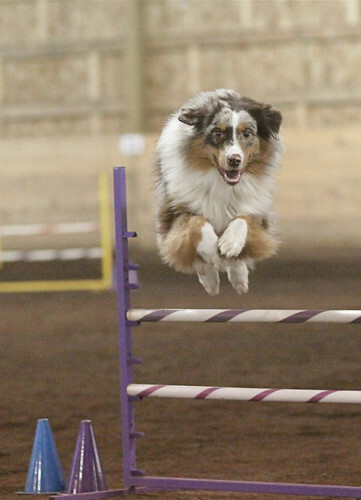 Looks like I have another bossy aussie in the agility ring. Now we just need to learn to work together better as a team. The coolest thing about this weekend was that there was a huge field that we could let our dogs off leash in. To wear Timber out I started throwing some frisbees to him. By the end of the three days he was catching the long throws with pretty good regularity. 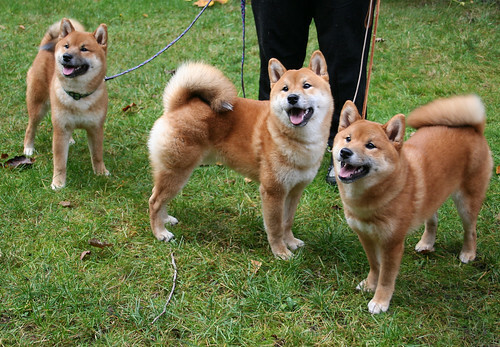 While Kona was in the show ring, the rest of the litter had a little get-together. Denise and I played personal manicurist to 12 little paws while the puppies had time to play. Denise and I faired pretty well. Only a few scratches and each of us got peed on at least once. Not bad for a days work. But, I'm sure my neighbors are wondering what we were doing to the poor little puppies with all the shiba screaming going on. 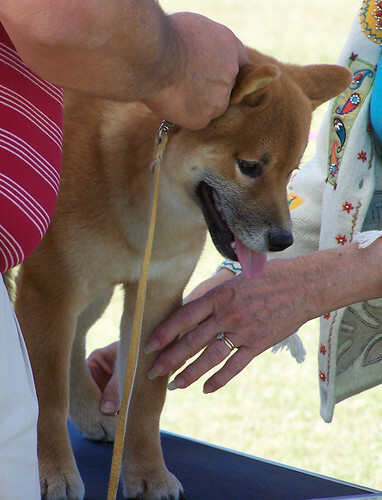 Those darn shibas and their nail trim phobias. But as you see in this after photo. They all survived. Today Kona won Winner's Dog and got another 4 point major! YAY. Both majors are out of the way. First show out in Tucson, Kona took Best of Winners and got a 4 point major to boot. WOW - OH- WOW Kona. That is awesome for a 6 month old puppy. Congratulations Valerie and Jeff for going through puppy hell to turn out a stable, wonderful boy that wows the judges like that. Two more days of showing! Thanks to Wendy for this photo of Kona from the match. "I seem to have lost something here on earth." Since Timber's nose didn't fill in, I couldn't show him in conformation. So I made the decision to neuter him. He's doing well. My calves are not. He flys by me and rams that cone into my legs over and over. 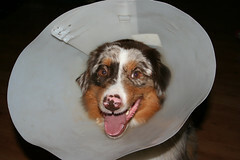 He's already broken one cone ramming it into furniture. So now he's on the second one. No stopping this boy - even with lost parts and a cone on his head.